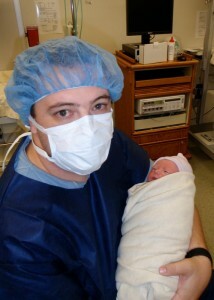 On Sept 17, 2009 at 5:36 AM Kaelum Mark Gardner joined our little family. Here’s his story. My wife, Chesnye, called me at work about 4:30 PM. “I think my water broke.” after a short explanation it really did sound like her water had broke and it was not simply the baby had kicked her bladder and caused a “leak”. I told her I needed to go tell my boss that I was leaving and needed to check on my wife. I also told her that I would call her when I was on my way home. My boss, Mr. Watson, was excited that he had not yet been knocked out of the baby pool; then promptly ejected me from his office with instructions to go take care of my wife. The drive home was interesting, Chesnye would have killed me had she known how fast I was driving in parts. I wasn’t paying a lot of attention to the speedometer until I saw another car pulled over and decided a speeding ticket would only slow me down. Chesnye was waiting for me on the couch downstairs when I got home. All I had to do was put the dog in the kennel and grab the bag she had packed. We then started the 15 min drive to the hospital (albeit much slower and calmer). The check-in process at Liberty Hospital is very easy, they have you pre-register a few weeks in advance, so the only thing you have to do when you get here is sign the “Consent to Treat” form. We had called ahead on our way and they had secured us the last room. I felt a little bad for the couple behind us, she was having contractions, and they were scrambling to get a room clean for her. The first nurse that saw us checked Chesnye with a PH strip and confirmed that her water had broke, we were going to be here for the duration. They hooked up the fetal monitors an took her vitals. Everything to this point was going great. Except that she was not contracting very strongly. The fetal monitor was pretty neat, you could tell when the baby kicked because there would be a little spike on the graph. 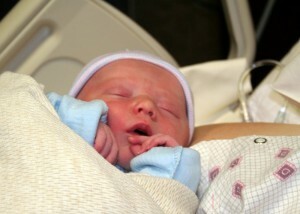 At 5:30 Dr Morris decided that it was time to help the contractions along and started an IV with Pitocin. The poor nurse couldn’t find Chesnye’s small veins. Luckily, after she dug around in both arms(ouch) finally found a suitable vein in her right hand and placed the IV. Chesnye’s contractions got continually stronger. She was showing a good contraction pattern, they were getting stronger. At 10:00 PM her back labor got so bad she asked for some IV drugs. The IV drugs worked for about an hour. I was able to catch a few minutes of sleep; Chesnye, however, was not able to sleep but was able to relax for the hour and catch a breather. She’d close her eyes but the contractions kept waking her up. After the drug wore off, the contractions got really intense. 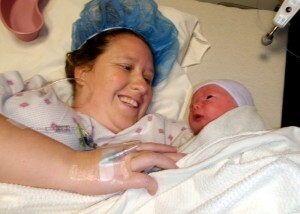 She asked for her epidural and Dr. Fox came around 11:00 and placed it. He did an awesome job! We were both able to sleep for a little bit. I got to hold him first! The next six hours were pretty uneventful, the nurses increased the Pitocin dosage and her contractions went on at full strength. At 5:00 AM Dr. Morris came in to check on Chesnye. She was not dilating. 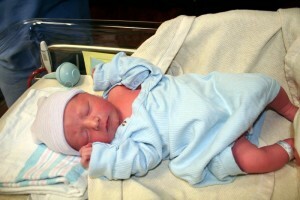 The decision was made to do a C-Section before the baby were to go into any serious distress. They prepped Chesnye and gave me a set of scrubs to change into and took her to the Operating Room. They said they would come get me when everything was ready to go. Holy crap was that a long wait ( I don’t really think it was that long, just seemed really long). When I walked into the OR with the nurse it was a little scary, there were blue sterile fields everywhere. The nurse pointed to a stool near Chesnye’s head, that was my spot, I wasn’t to touch anything. The operation began, from my perspective all I could hear was hushed muttering from the OR Doc, and the Nurses. I chatted with the Anesthesiologist, and the Nurse in charge of monitoring all the vitals for a little while. Chesnye was a little out of it and didn’t make for good conversation. At 5:35 there was a bustle on the other side of the sterile field, nurses were handing instruments around pretty fast, there was a lot of shuffling and at 5:36 a little cry. I never thought that such a little noise could bring such big emotions to the surface. The nurse next to me asked for my camera and snapped some pictures of the doctor cutting the cord. I won’t post those here, those are only for my family’s collection. They took him and cleaned him up a little, cleared out his lungs, and did his measurements. He did not like to be cold. I still think the first thing I noticed is that his brow furrows when he’s mad in the exact same way Chesnye’s does when she’s mad at me. They got him all wrapped up and handed him to me. I then took him over to my stool and let him meet Chesnye. The rest of the operation took about an hour. All I could do was smile under my mask. My jaw hurt for hours afterward. They got Chesnye all patched up. In the mean time they took a picture, did a slick sheet (footprints) and gave wristbands to baby, me, and Chesnye. He is so beautiful. I am so happy for you both. YEA!!! Congratulations! What a great story! You sure have a cute little baby boy. Enjoy your new parenthood and catch some sleep while you can. I’m glad everything went well. How does it feel to be a daddy? Kaelum is so cute. I like the story. Clears up a few of the lingering questions i had between text messages. I’m so happy for you two or should I say three now…lol see you next weekend. Love you all. We are sending nothing but love and best wishes for your little family! We are so happy for you! I love your story, it is so sweet to hear from the Daddy’s point of view! 🙂 Happy Everything! What a cutie! Congratulations and best wishes to you both. I can’t wait to meet him. Oh Mark that your story is sooo sweet. You are a great daddy. Hope to see you all soon. Do you prononce his name K lum??? Congratulations!!! Great story!!! Hope you and Chesnye enjoyed the pizza. Sorry Kaelum couldn’t have any yet.